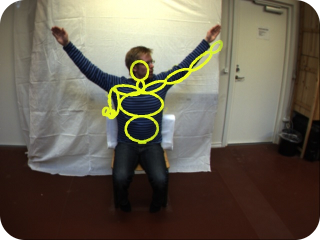 This web site is a companion to the EMMCVPR 2009 paper "Three Dimensional Monocular Human Motion Analysis in End-Effector Space". The main purpose of the web site is to host the videos referenced in the paper. These can be found in the next section. The paper discusses the choice of state-space for human pose estimation problems. The straight-forward choice of state-space is the space of angles between all joints in the human body. Sadly, this state-space is very high-dimensional, which makes it computationally expensive to perform pose estimation in this space. 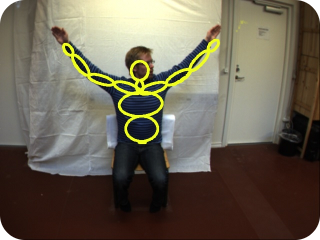 In this paper, we propose using the end-effector (hands, head, ...) coordinates as state-space, and then to use inverse kinematics to infer the angles from these coordinates. Preliminary experiments show that this provides a huge speed-up, with little to no loss in accuracy. The following videos illustrates the usefulness of the chosen state-space. In these videos we are not aiming at perfect tracking as this requires a much more tuned system for making visual measurements. The point is simply that we can get results that are comparable to using 5000 particles in the full pose space using only 25 particles in end-effector space. Since each particle requires the evaluation of the likelihood function (which is computationally expensive) this provides a vast speed-up. Specifically, the end-effector tracker is about 100 times faster than the full-pose tracker. For comments or questions please contact Søren Hauberg.